Its just a little too hot to get too excited about organizing. But what about those fun organizing projects you have been putting off? Here are 5 fun summer organizing projects that will make you swell with pride that they are now off your list. Remember that enormous stack of magazines you have not had time to read all year? Grab a handful and hang out by the pool or beach. Be sure to eliminate them as soon as you have read through them. Once is enough for browsing! Drop them off at a local emergency care room for those waiting. Love your family photos but not sure how well these digital treasures are organized? Set up categories on your computer to start with, then begin gathering them from all the iphones, ipads, digital cameras, and facebook. You will be so thrilled to have them in one spot. Now you are ready to make a picture book too! Are recipes all over in your home, papers, or office? Now is the time to gather them together. Sit with a tall glass of tea and be realistic what you will make. Does the recipe require too many ingredients, too much time, or no one but you will eat it? Time to toss the extra recipes and keep just what you want. Set up categories, sort and decide if a notebook or recipe box will be better to keep these. Get ahead for fall by creating your family command center. This fall you will be the most organized ever by setting up a calendar, corkboard, chalkboard and wall pockets to keep your family activities organized. 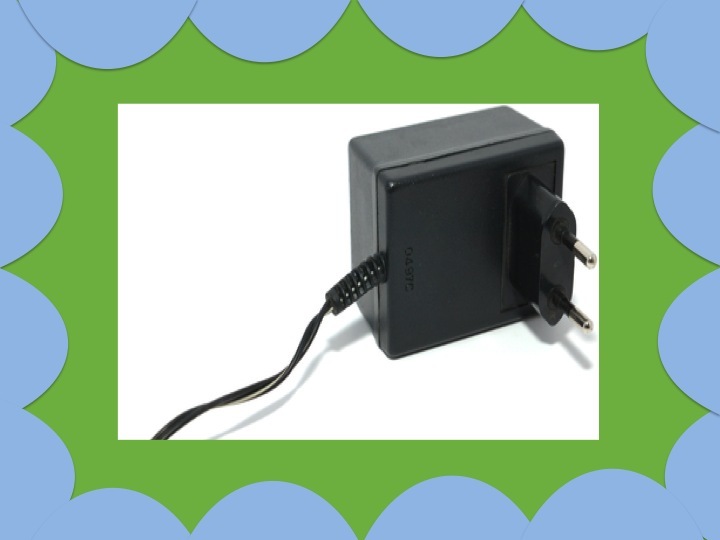 Browse on http://pinterest.com/EllenDelap/family-command-centers-communication-and-organizat/ to gather ideas. Then head to your favorite HomeGoods, Target, WalMart or other shop to pick up and install all the pieces. Organize a ME day. This is a day just for you to regroup, relax, and rejuvenate. Your family has lots going on and you will need time to “put on your own oxygen mask first.” Set aside time throughout the summer for this important and precious time. 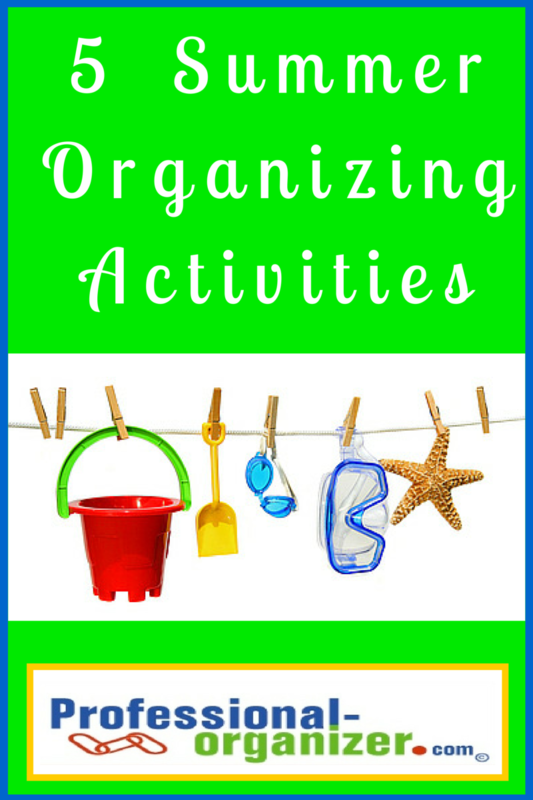 What fun organizing activities do you have planned this summer? Hugs and Happy Organizing posts are about client successes. 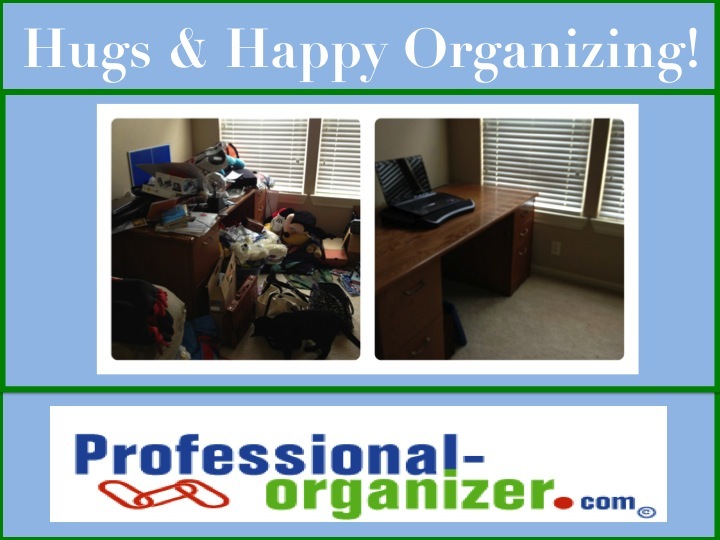 Here you will find a happy organizing story about teen organizing. Teens crave organization, but often are too busy to work through the challenges of creating systems and routines that work. Offer an incentive and find what is important for your teen. Set a time to work together on the project that works for both you and them. Together purge and eliminate items that are no longer useful or needed. Allow your teen the opportunity to let go of items, even if you are not comfortable with that. Group items together that are used together, such as media, books, and supplies. Think of this as stations within the room. With less items in the space, it is much easier to maintain. Help your teen establish times to get items back into order. 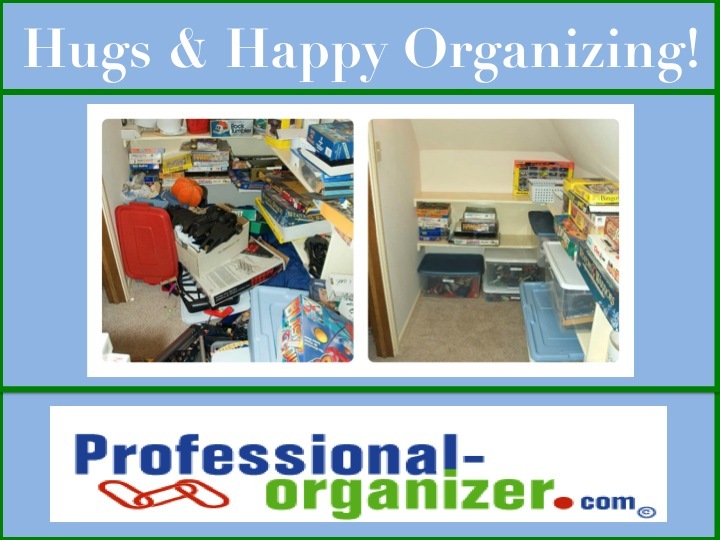 Our kids are very busy but it is always important to get organized. 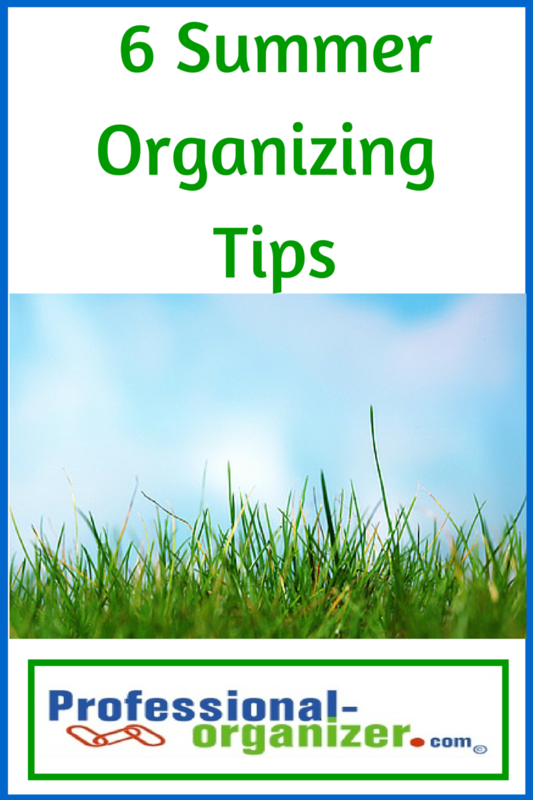 What ways have your helped your teen get organized? If you are fortunate enough to have additional storage, you are truly blessed! Even storage can be in total disarray when we have too much. Group items together that are alike. In storage that may be clothes, games, office supplies or furniture. Once gathered, decide what to keep and what to donate, sell or trash. Storage is usually filled with items that you have not made a decision about… so make a decision! Take items away immediately. You won’t regret this. Place the items on shelving depending on the access you need to the item. Frequently used items need to be near the door and easy to access. If you want your kids to access items, be sure these are low enough. Label where the item goes so everyone knows where to put it back. Summer time is fun time! It’s the time we think about letting go of all the routines and the responsibilities and building lots of memories. However, summer fun is best when there is a little organization and preparation. With lots of fun scheduled for your family, you’ll want to get organized! Family fun begins by knowing all the dates and commitments you and your family have this summer. Start by adding all the upcoming dates on a master month at a glance calendar. Host a family meeting so everyone can add their dates, including holidays, camps, vacations, vacation bible school, birthdays, Father’s Day and more. Be sure each family member has their one most important summer activity on the calendar. Once you see the dates, now its time to set dates to prepare and pack. It’s tempting to have back to back fun, but it can also create a lot of disorganization if your camp stuff is not gathered together or you feel frazzled when setting off on a trip. Make a list and set a time to pack, gather together what is needed, and finalize plans. It takes just a few minutes but is well worth your time. With each summer activity you will have less stress and more fun! Lights out for everyone by 10:30 pm. Each person does one load of laundry twice a week, including putting their laundry away. Sunday night is family dinner night. One hour of technology a day for everyone. No one is left in the kitchen alone to clean up. Be specific so everyone is on board with the routine. Establish deadlines so everyone knows when chores should be complete. Work together as a team on family responsibilities means chores get done quicker! A parent and one child can work on these together for an hour and feel a sense of accomplishment. If one hour is too long, set a timer for 20 minutes, three times, and you have accomplished your goal. Set up a reward at the end of your work time to congratulate your team on their successes! What’s on your list for family fun this summer? 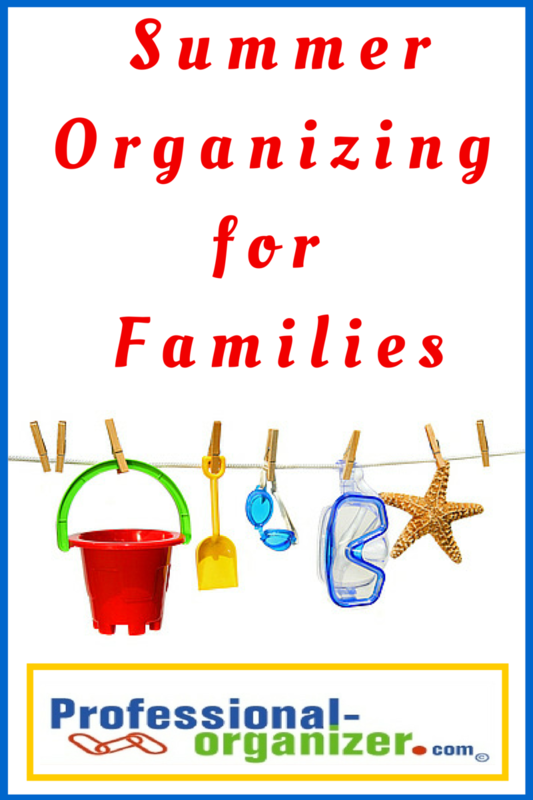 Summer time fun begins with being organized! 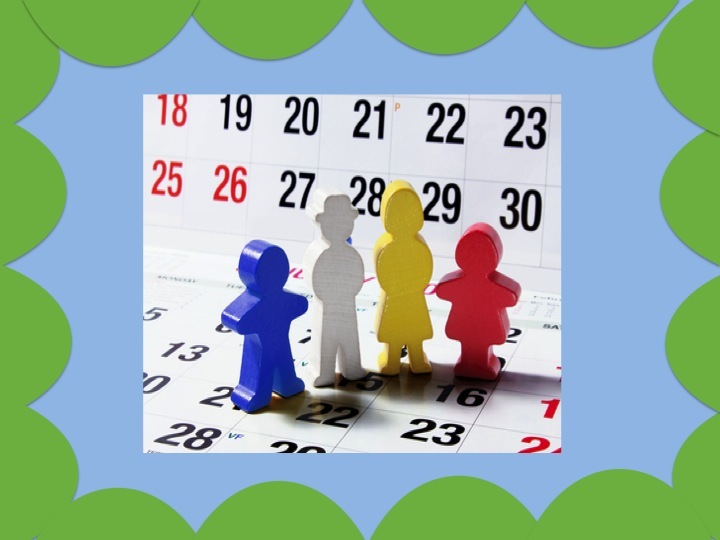 Gather your family together and get all the dates on your family calendar. Be sure everyone is charged up to go! Keep all the technology charged in a public spot so everyone gets a great night’s rest. Load up your ipod with summer tunes and your Nook, Kindle or ipad with great summer reads. Add kid friendly books too to encourage summer reading. 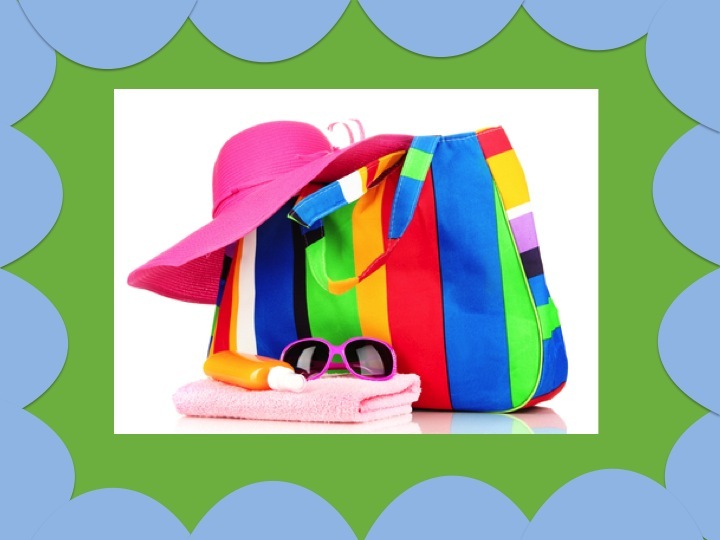 Pack a summer bag for each activity and for extra car time for your kids. Checklists for travel make packing easier too! 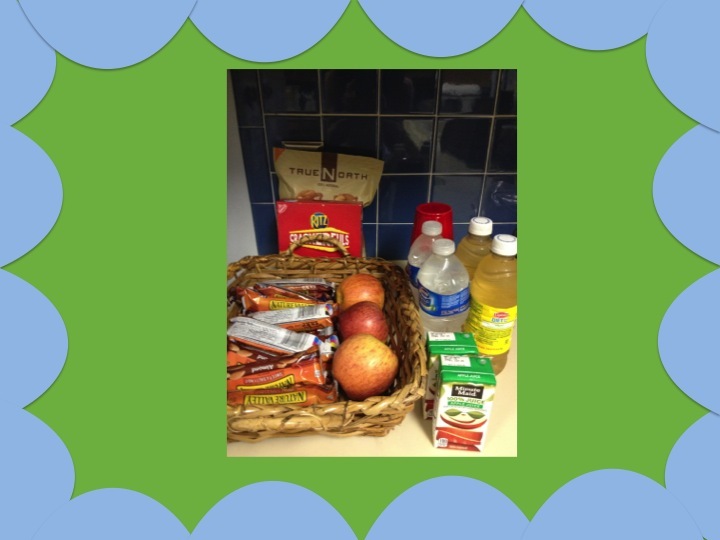 Set up a healthy, organized snack station with kid friendly stuff. It will be easy for everyone to grab a snack whenever they want to and you will be sure you and your kids are keeping on track with fruits and hydration. 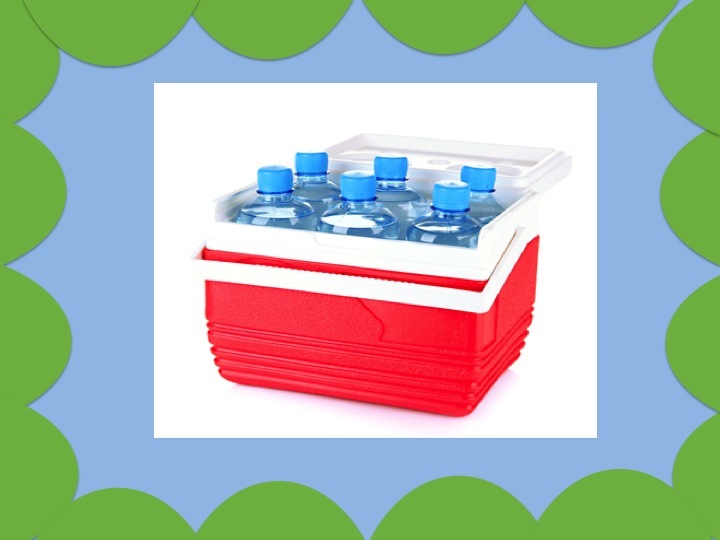 Keep a cooler for water in your car or in case you need to drop by the grocery. Treat yourself to some fun summer flip flops as a reward for your organizing efforts. Summer is more fun with preparation and organization. What will you be organizing this summer? The 21st century has brought a new kind of garage sale! It’s the online garage sale, posting to sites where waiting customers review your items and connect with you by email. 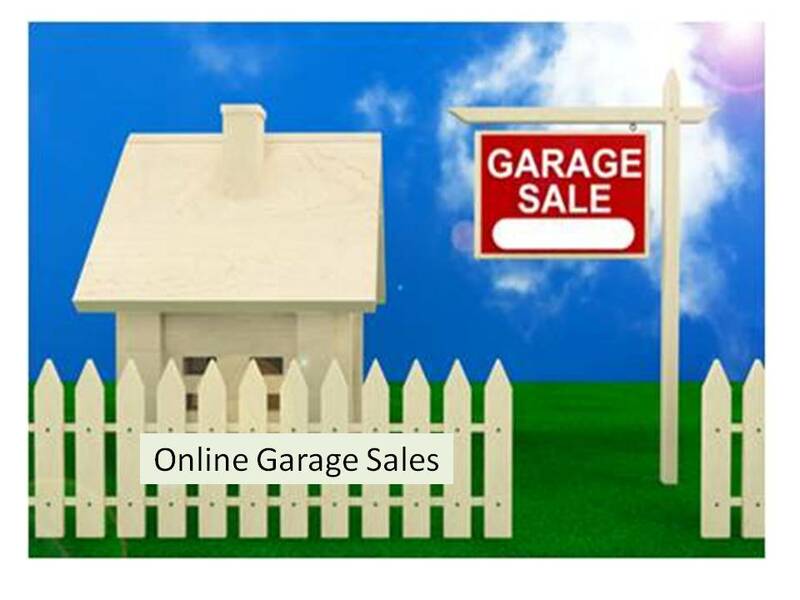 Virtual garage sales are an easy way to make money from your clutter as well as eliminate unwanted goods. There are many advantages. Online garage sales are typically free. You can post your item any time day or night. You take pictures, prices your item, and upload your information typically anonymously. Writing a detailed description, including size dimensions, brand, and other details make your item more attractive to buyers. The best way to price your item and see if it is valuable is to check the prices of similar items on E-bay site’s “completed listings” section after the auction has ended. For a local online garage sale any items, regardless of size and weight, can be sold. You can meet your buyer at another location and they pay cash for your item. For national sales, think about the cost of shipping and price your shipping in the cost of the item. Be sure to receive payment in advance of shipping. In Houston and nationally there are many online garage sales. Craig’s List and Ebay are the best known online garage sales. Post your item on an local online garage sale. In the Houston area, sites include KingwoodYardSales.com, TheWoodlandsonline.com, houston.bookoo.com or chron.com. If you are still wanting to rummage for more traditional garage sales, you can use Yard Sale Treasure Map and Garage Sales Tracker to find a live garage sale too!